Does the JF-17 Finally Have Buyers? The Sino-Pakistani jet could finally have found prospective buyers. The JF-17, a joint Sino-Pakistani fighter project, is a single engine fighter developed, conceptually, as a modern MiG-21. Given how global fighter fleets have deteriorated since the end of the Cold War, the idea seemed sound; a low-cost fighter that didn’t present major technical challenges, and that could serve as a cheap option for revitalizing many air forces. Like many such low-end projects, however, the “maybe good enough” JF-17 has yet to catch on with defence ministries fixated on prestige and technology. Recently, however, indications have emerged that a few countries might have an interest. Argentina badly needs to recapitalize its fighter fleet, which continues to operate some of the same aircraft that fought in the Falklands War. Unfortunately for Buenos Aires, however, the United Kingdom exercises an effective veto over any purchases from Europe. The trans-national nature of the modern aerospace industry (and especially of the European defense sector) makes for multiple veto points in defense deals. British producers have a hand in the production of components of the F-35, Eurofighter Typhoon, and Saab Gripen, and London has wasted no time trying to quash potential deals for new fighters. Britain has applied similar pressure on U.S. fighter producers. This leaves Argentina with few options. It can turn to Russia or China, and at the moment the Argentinian government appears to be talking to both. Apparently, Nigeria has also expressed some interest in the JF-17. A small organization with few dedicated combat aircraft, the Nigerian Air Force has relied on the Chengdu F-7 (China’s MiG-21 clone). The JF-17, which is heavily influenced by the F-7 and shares some characteristics with it, might be ideal for Nigerian service. Jane’s reports that Nigeria could purchase as many as 40 JF-17s, which would provide a huge boost for its air force and for the export prospects of the fighter. The JF-17 is cheap, and given the source material, buyers might have some hope that it will prove a reliable airframe. Russia has positioned itself a bit upmarket for countries like Nigeria, and perhaps even Argentina. If Nigeria and Argentina sign on, then similarly positioned countries such as Venezuela, Egypt, and others might develop an interest. And if buying the JF-17 leads to development of a solid procurement and upkeep relationship between China and a customer, then another fighter looms on the horizon. An Argentinian Air Force pleased with its acquisition of JF-17s might well consider the wisdom of acquiring the J-31, if export promises come true. Success stores in the modern arms trade come from building relationships, and it’s possible to see the JF-17 sale as the beginning of a high-low mix of Chinese fighter exports. 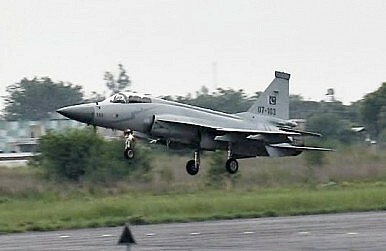 A False Start for Sino-Pakistani JF-17 Thunder? Malaysia publically declares that it is not considering the JF-17. How come?